No-Dig Pipe Relining Repairs Don’t Dig Pipes Up, Reline Them! Backed up drains? Tree root infested drains? Broken pipes? Forget digging up and replacing. Pipe relining is the way to go! With pipe relining, you don’t get to deal with the expense of paving, reinstating landscaping, or retaining walls and it leaves no mess behind! In fact, our epoxy pipe relining product is much stronger and longer lasting compared to a brand new PVC pipe! Unlike in the past, when the only way to fix broken drain pipes was to dig them up and then replace the damaged sections, our pipe relining solution requires no digging at all. Digging up pipes disrupts your business or home and creates a huge mess. Not to mention the cost of restoring the landscaping and property to its original condition. Thankfully Pipe Relining offers a reliable, quick and simple alternative. Our epoxy based pipe liners are the ‘no dig’ solution for repairing damaged and blocked drain and sewers without the need for disruptive excavations. 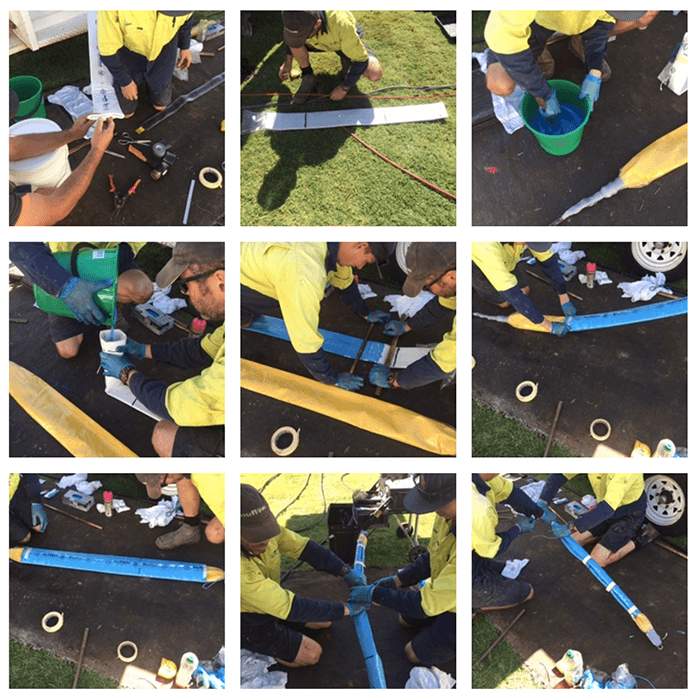 The Nuflow pipe rehabilitation process of ‘Cured In Place Pipe’ [CIPP] is the most versatile pipe relining system throughout Australasia. The liner is an epoxy resin reinforced pipe that is completely structural; furthermore, it is a stand-alone pipe with or without the host pipe. It completely bonds to the host pipe with no chance of root systems re-entering the pipeline, and that’s guaranteed. Call one of the best Bundaberg plumbers. Fantastic service- best in town! Got a text message before the technician arrived to say he was on the way...turned up punctually on the scheduled date, sorted out the problems, great communication all the way through. Friendly, reliable, affordable. Highly recommend this great company!! Prompt, Friendly, Professional service cannot recommend Sam and his team highly enough. If you have any drainage or pipe repair issues don't waste your time with anyone else these guys are your answer. Very Happy. Prompt quick service and a great repair. Highly recommend Nuflow wide bay, Sam is very helpful and talks you through the whole process from start to finish. Great service. Sam and his boys are always quick to get on site and a pleasure to deal with. Thanks Guys. They came on time, were extremely efficient and helpful. Did a great job. This is the 2nd time they have been to our place and each time the service has been excellent - and fair priced. Can we Reline only the Damaged Section? Nuflow Wide Bay can reline an entire drainage system if necessary, or install a short section of liner at any point along the drain to seal and repair only the damaged section. Especially relevant, many local councils, Including Bundaberg Regional Council have been using this type of drain repair for many years. If your pipe is cracked, caved in, has root damaged, burst, has leak detection or any other pipe damage we can fix it. Especially relevant, many local councils, Including Bundaberg Regional Council have been using this type of drain repair for many years. With an expected lifespan of over 100 years and a 50-year product warranty, pipe relining makes sense when compared to traditional pipe repair methods. Since most of the work is underground, residents are generally unaffected by the works occurring, and work can be undertaken while there is still flow in the pipe. What kind of pipes can be relined? Our plumbers in Bundaberg are dedicated to giving our customers the best customer service possible. The Nuflow System has been proven to be effective in endless kilometres of lined pipe, and all pipe relining jobs are guaranteed for 50 years. Contact us NOW to make an appointment or request an obligation free quote.